Unless you’ve been living under a rock, you would know how huge Instagram has become since its debut in 2010. It currently has 200 million users, and analysts are saying that it will double by 2020! Instagram has become a photography goldmine for food, travel, business, and all the categories you can possible think of! Let’s not forget the #selfies and #ootd’s, too! Both are an Instagram must! Almost everyone is showcasing their photography talent on Instagram. Some do it just because, while others are doing it in a professional way. Many talents have been discovered on the said photo-sharing app, and the next one could be you, so it doesn’t hurt to try. If you’re serious about making your interior photo noticed or just simple want a nice shot, consider these simple guidelines in making yours Instagram-worthy! Make use of the natural light surrounding your space. First of all, it looks great on photographs; secondly, it’s free! The kind of light you need depends on the mood you want your photo to have. If you want a cheery and delicate vibe, take a photo of your interior in the morning. If you want a moody shot with a subdued touch, take an interior shot either during midday or the golden hour. How the light falls on your interior will definitely dictate the feel of your photo. Do you need to have your home squeaky clean for the shoot? Not all the time. If you are going for the Scandinavian meets Shabby Chic meets Urban Minimalist type of atmosphere, then yes, of course. On the other hand, if you’re aiming for something rustic, lived-in, and downright hipster-ry ambiance, then something weathered and mussed up will do just right. Don’t forget your add-ons or accessories to make the final piece look perfect. Move around your furniture to see how it looks. 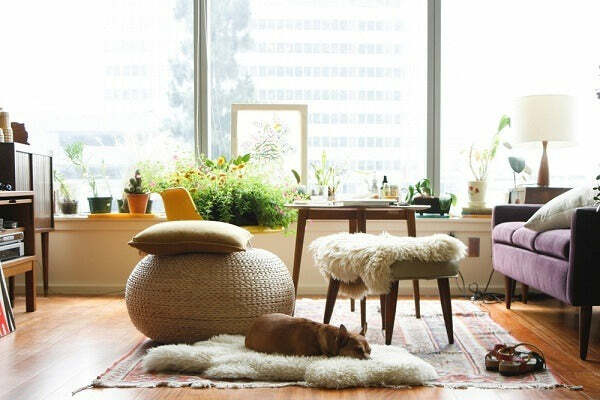 Place your favorite pet on the chair to dramatize the look. You can also use these accoutrements to conceal an odious spot – a throw pillow hiding a hole on the sofa, for example. Direct-center can be too proper, too common, too rigid, too boring. Try using the Rule of Thirds when you do this. It is a good guide for composition. Use an imaginary grid line that’s divided into three columns vertically and rows horizontally. You then align the most important part of your subject into one of the lines that intersects. Once you do this, your subject will not be positioned smack in the middle, making the shot more interesting. You have to make a conscious extra effort in doing this because our natural tendency is to balance an image. A carefully crafted space, with an almost ruler-spacing placement of furniture, is lovely; but, it will not hurt your interior photo by putting something out of place either. Go for a different perspective to make your shot appear fascinating. In the living room, for example, place one of the lounge chairs in a slightly different angle or in a pile of books on the coffee table, open the topmost one then slant it a few inches from the center. Don’t be afraid to mix textures, colors, and patterns in a single shot. Keep in mind that this has to come together in a way that’s pleasing, not a horrid mess of sorts. There has to be a unifying factor in the things that you put together. Color is one of the best elements that can anchor the whole look. If your rug has a trace of green on it, the same color should resonate in one of the objects in the room, too; a lampshade or a framed art, for example. The most important thing is to let your creativity flow through. Never, ever put a limit to it, and most of all, have fun!